Gosnell Movie – Good News & Bad News & Good News & Good News – Pro Life Legal Defense Fund, Inc. The first good news is that Gosnell – The Trial of America’s Biggest Serial Killer is coming to theatres nationwide on October 12th. Gosnell is a feature film about America’s most prolific serial killer, and the fight to bring him to justice. It shows how the political establishment knew of his activities but allowed Gosnell (now serving three life sentences) to keep killing because they did not want to shine a negative spotlight on abortion. It features a top-notch cast, which includes Dean Cain (young Superman), and is directed by veteran actor Nick Searcy. The bad news is that, in Massachusetts, it is presently scheduled to open at only one theatre (Eastfield 16, 1742 Boston Rd., Springfield, MA). The second good news is that there is something that each of us can do immediately to promote wider distribution of this poignant and powerful pro-life production. You can call your local AMC, Cinemark and Regal theaters and ask them to show Gosnell when it opens on October 12th. Theater chains really pay close attention if enough people phone and demand a movie. You can make a huge difference! At this time, Gosnell is scheduled to open about 180 locations across the nation and you can find them here. The Gosnell team is hoping to have the movie in 600-700 theaters so that most people in the US will be close to a cinema showing Gosnell on opening weekend. 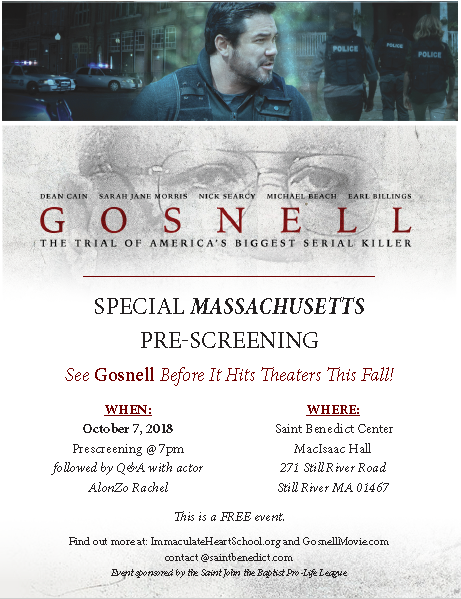 The third good news is that you can see a FREE pre-screening of Gosnell on Sunday, October 7th at 7:00pm (Saint Benedict Center, MacIsaac Hall, 271 Still River Rd., Still River, MA 01467). You can see the flyer below. One of the Gosnell actors, AlonZo Rachel, will be present to answer questions following the showing. A flyer for the special pre-screening is attached. The establishment wants this film to fail. Don’t let them succeed, please call your local AMC, Cinemark or Regal theater today. Please share this wonderful opportunity with your family and friends!